The next “Coffee With a Cop” is on Tuesday, October 16th, from 5 p.m. – 6 p.m. at Mama P’s located 3993 Georgetown Road. 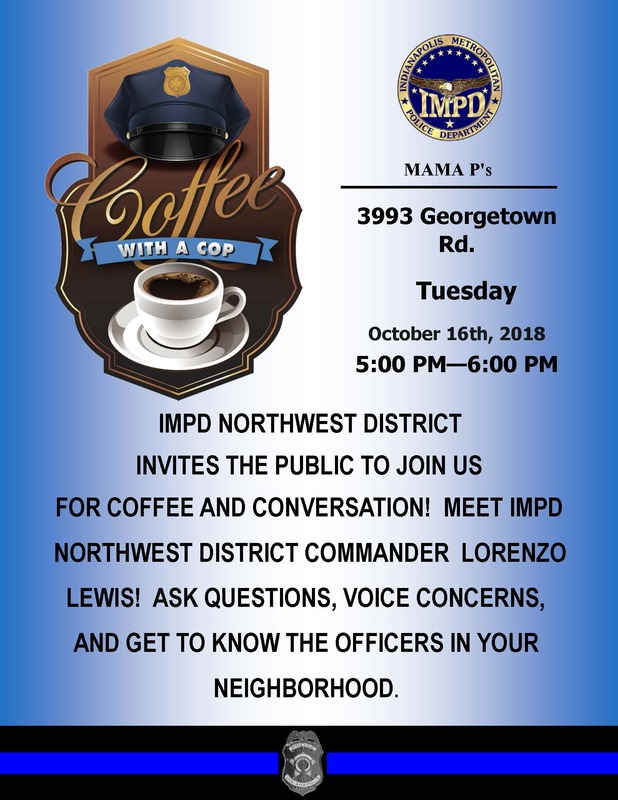 This is a great opportunity for you to talk with the officers who work for our area every day as well as get to know our Northwest District Commander Lorenzo Lewis. (Don’t forget that the West Side Chamber of Commerce’s Candidates’ Forum starts at 7 p.m. at the Chapel Hill 7th and 8th Grade Center, 7320 W. 10th Street.) See the attached flyer for more information. I also have attached information about the next Northwest District IMPD Task Force Meeting. It is on Wednesday, November 7th from 6 p.m. – 7 p.m. at Northwest District Headquarters, 3821 Industrial Blvd. The speaker should be very interesting. Hope to see many of you at one or both of these meetings. Please let others know about these opportunities to get to know those who protect us every day better.